After Contractor C’s disappearance we took a deep breath and considered our options. We had few. We knew several folks in George Town who had gone through, or were in the process of, a refurbishment/renovation. None of them had many kind things to say about their contractors. For a while we considered hiring one known for his excellent work …. and also for disappearing for weeks at a time, multiple times, in the middle of a job. If you watch him very carefully and keep a tight reign on the money (ie., keep him tethered to the job by doling out payments in tiny increments) you might be able to make it work, a couple of people advised us. The fact that we mulled this over for more than one minute indicates that we were edging towards desperation. But it was desperation at a low level. Sure, we wanted to get going on our house so that we could finish it and move in. Yes, we didn’t relish the thought of paying rent and a mortgage indefinitely. But after a month or so we entered a sort of “let it be” mindset similar to that which we’d experienced after our first offer on a George Town property had fallen through. The rent-mortgage load wasn’t killing us, yet. If it was meant to happen it would happen. And if it didn’t … well, absolute worst case scenario we would (with regrets) sell Ah Tong Tailor and move on. Then, about two or three months after Contractor C absconded with our plans, a friend of a friend referred us to a contractor his family had been using for additions/renovations/odd jobs for over two decades. This was good — a personal connection, weight to bring to bear if need be. Dave telephoned Contractor T and we made an appointment to meet at the shop house in January of 2011. Once inside the house we handed Contractor T the list, minus quotations, drawn up by Contractor C. We walked around and he looked and looked, moving his hands over walls and poking at rotten wood. Right away he began to find problems with the first quote. When we’d done the walk-through with Contractor C he’d answered “No problem” every time we asked “Can you do this? Can we change that?” At the time that was comforting. But now, as Contractor T pointed out Ah Tong Tailor’s tiny-to-the-unschooled-eye but critical structural issues it started to seem that Contractor C was probably the kind of guy who quoted low to get a job, rushed it, collected his money, and walked away. If there was hard truth to be swallowed we wanted it fed to us before we got started on the refurbishment — not after we’d moved in, and all of the problems we should have taken care of in the first place surfaced one after another like pimples. 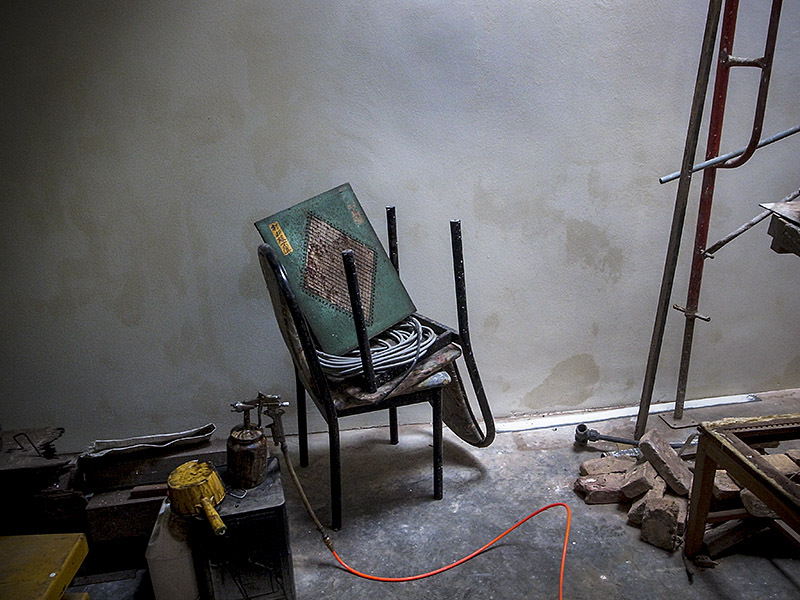 Another thing we liked about Contractor T: his obvious appreciation for old stuff. We didn’t know it at the time, but he collects old wood, old metal, old fans, old cabinet pulls, old Anything to Do With Buildings, and keeps it all on his property. He sells the stuff of course, and he uses it in jobs that he works. The man has an appreciation for the way things were made back whenever. And as we walked through the house he demonstrated this by knocking on the heavy timber door with its thick sliding bolt that separated what would be the master bedroom from the bathroom, and nodding when we said that we wanted to keep it unfinished. We wanted to reuse as much timber as possible, and that didn’t seem like a foreign concept to Contractor T. We said that we would keep Ah Tong’s signage, and he smiled a little bit. 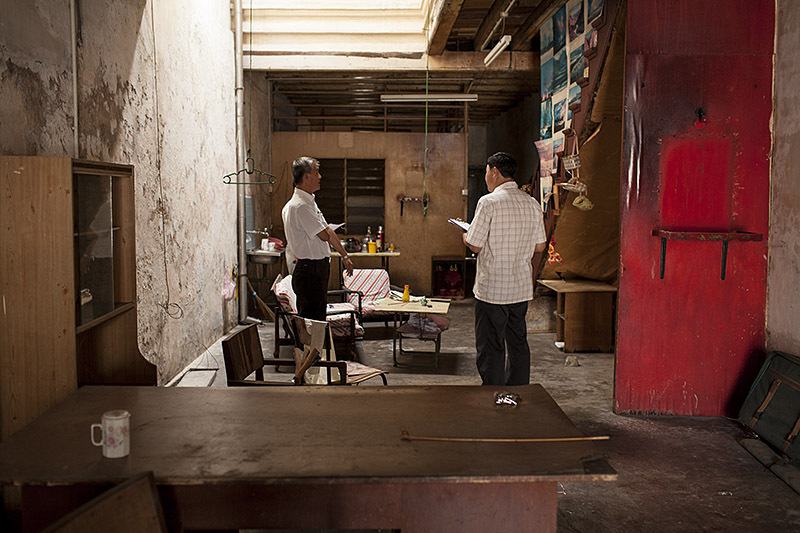 This made us feel that we wouldn’t be fighting every step of the way to retain as much of Ah Tong Tailor’s history as we could, while turning the shop house into a useable, liveable space. Contractor C had said he could complete the job in 6 months. “Oh no. Eight to twelve months at least,” said Contractor T, who would be paid by the job, not by the hour. And he was busy with another job, so couldn’t start on ours until June 2011. We were now looking at moving into the house not later that same year, but in the second half of 2012. A week later Contractor T had his daughter email us a quote (the man doesn’t do email). We met him once more at the house to make some changes and additions. It ended up being 2/3 more than Contractor C’s quote — mostly because of additional structural work. A month later we shook on it. In September of 2011, one year after we’d taken possession of the property, we handed the keys to Contractor T. We’d already unearthed and carted home a few keepsakes, so we told him to go ahead and clean out everything that was left: beaten-down furniture, the old kitchen sink, pots and pans, broken plates and chipped glasses and other odds and ends. A few days later we stopped by the house to see what it looked like empty. Contractor T and his crew had moved in saws and a worktable; there was paint-speckled metal scaffolding propped against the walls. And there was one small object that Contractor T had found, and saved. 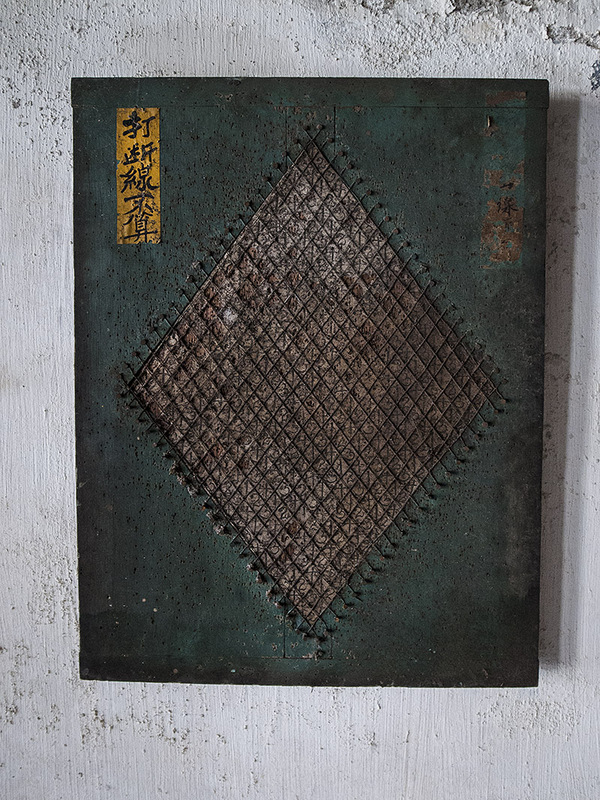 Hung from an old nail near the front of the house was a handmade dart board he had found tucked into a storage area under the shop house’s eaves. A square of wood painted dark sea foam, wire strung in a crosshatch between 84 nails edging a dirty paper square. A strip of yellow with Chinese characters that say something like “does not count if you break the wire.” (Thanks to commenter Albert for that translation.) The board is pocked with hundreds of dart holes; we imagine the tailor made good use of it between customers. Dave and I had confidence about Contractor T going in. But perhaps more than anything else, seeing that dart board hanging on our wall assured us that yes, we were all on the same page. We know that Contractor C would have chucked that old piece of wood out without a second thought. Contractor T gave it pride of place in what would be its new home. As work on our shop house has progressed over the last thirteen months that dart board has been cleaned and dusted and carefully moved from the front to the back of the house, from the ground floor to the first floor and back downstairs again. Whenever our refurbishment enters a new phase Dave and I walk into the house and look for the dart board. And when we find it, we imagine where we’ll hang it when Ah Tong Tailor is home. 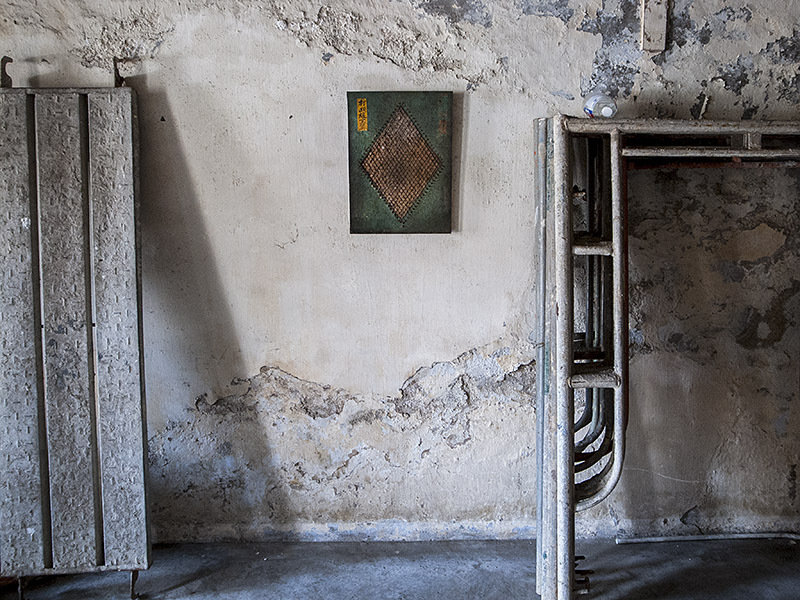 Twenty-two months ago we put a deposit down on a pre-World War II shop house in George Town, the capital of Penang island, just off Malaysia’s northwest coast. We’d been looking for a property there for almost six months. We’d seen alot of outrageously priced dumps, and many places so poorly refurbished that they no longer had any character. We’d had an offer accepted on two side-by-side houses only to have the owner pull out of the deal a week later. We’d almost given up hope. 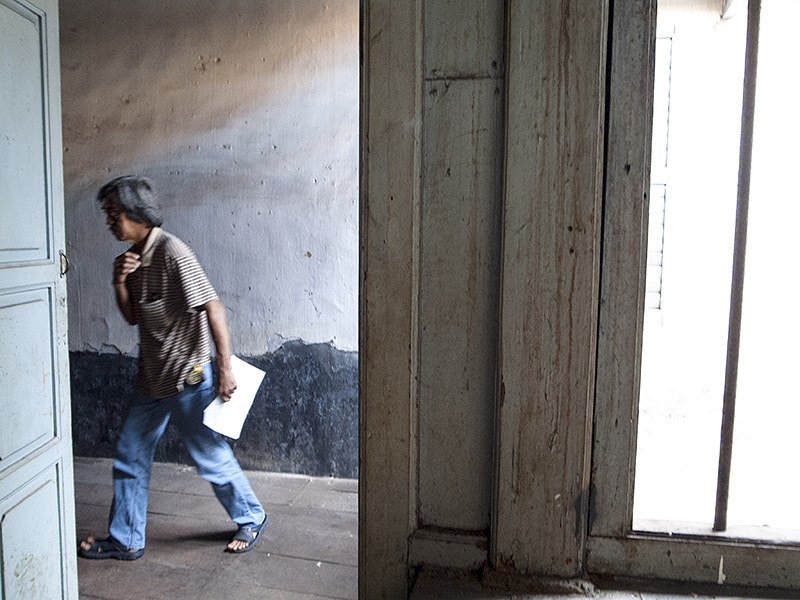 Then one morning an agent walked us through a shop house used as a place of business by an elderly tailor and his wife. They no longer lived there but were still working out of the ground floor. They were ready to retire. We walked the length of the cement-floored shop, out the back door and into a small courtyard. We scanned weathered beams and blistered walls. We climbed the timber staircase to the second story, where we found original double doors, shutters sagging around an interior airwell open to the sky, a soaring, coffee colored wood ceiling, and much water damage. We could see the possibilities. It felt right. After maybe forty-five minutes in the house we thanked the tailor and his wife and walked back to our hotel. We ruminated, playing pros-and-cons, for twenty minutes. We called the agent and made an offer. The house’s owner countered, and we countered back. Within an hour the deal was done. If this one didn’t fall through too we’d be home owners in Malaysia. In September of 2010 — one year ago — we took possession of the property. We drove to Penang from our home in Kuala Lumpur and collected the keys. With knotted stomachs we put key to lock and opened the door to “our house” for the first time in 9 months. We stepped over the threshhold, threw open the front shutters and sighed, relieved. Over the next few months we measured and drew and dreamed. 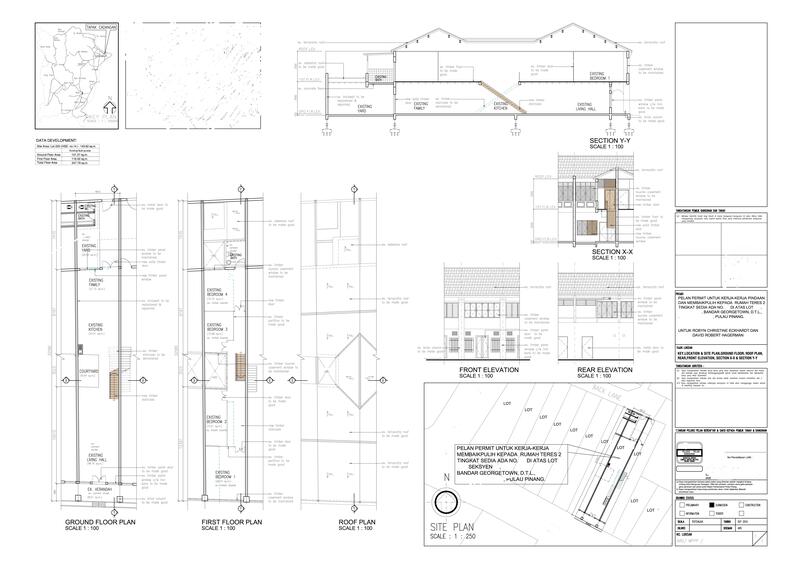 We had plans drawn up, applied for a permit, and began looking for a contractor. (That last bit took longer than we’d expected.) Last week — finally, finally — we began work on the house. 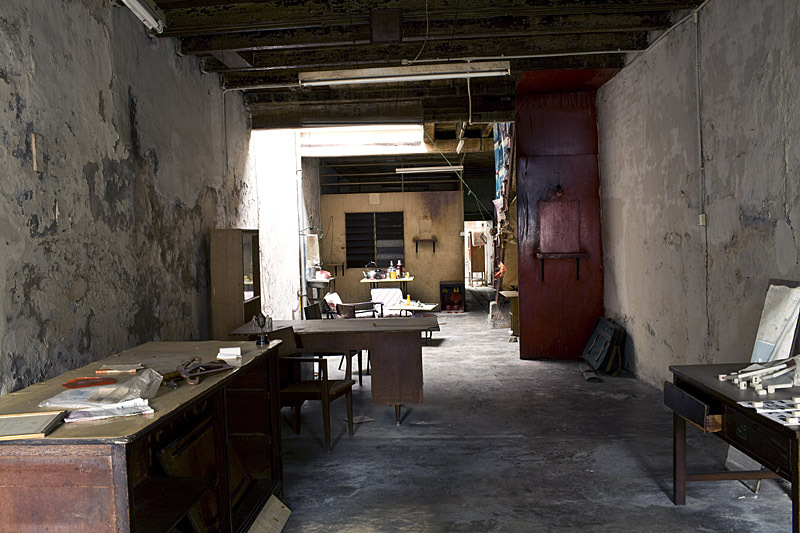 There’s much to be done before Ah Tong Tailor becomes a home in George Town. One of us is a writer, the other is a photographer. In words and images, we’ll take you along for the ride.